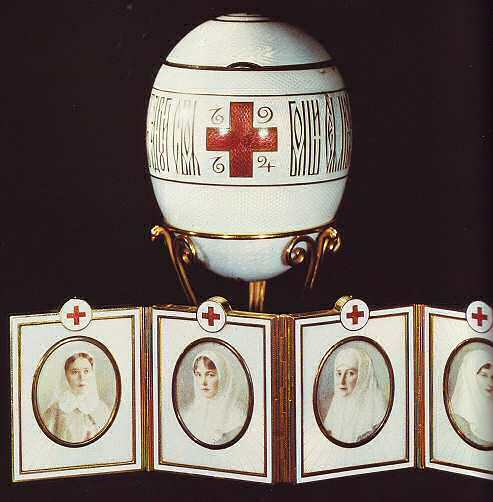 The 1915 Red Cross Portraits Egg is made of silver, gold, opalescent white and translucent red enamel. The miniature screen is made of mother of pearl and watercolor on ivory. Opalescent white guilloche enamel covers the chased silver ground on this Egg. Two opposing red enamel crosses bear the dates "1914 and "1915". A Russian inscription, in stylized god enamel scrip reads "Greater love hath no man than this, than a man lay down his life for his comrades". On the top of the Egg is the crown and monogram of the Dowager Empress Maria Feodorovna, in silver. At the bottom is a six-petal rosette. and Grand Duchess Marie Pavlovna, the Tsar's first cousin. 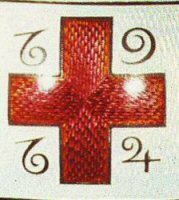 each wearing the uniform of the Red Cross, whose symbol surmounts the individual panels. Each miniature is backed with mother of pearl and has the monogram of the person who appears on the front. 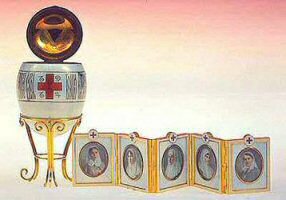 The Red Cross Egg pays tribute to the service rendered to the Red Cross by Maria Feodorovna, first as Tsarevna (crown princess) during the Russo-Turkisch war of 1877, and then as president of the organization from the beginning of her reign until the fall of the Romanov dynasty. When World War I broke out in 1914, the trouble that had loomed at the edge of the Romanov's awareness began to penetrate the protective shell of imperial privilege. 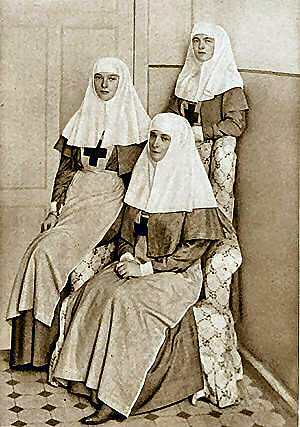 In response to the suffering of their people, and in an attempt to present an image of patriotism and concerned involvement, Alexandra enrolled herself and her older daughters in nurses' training and had the palaces converted into provisional hospitals to care for the increasing number of wounded. Meanwhile, the Tsar spent more and more time at the front with his armies. Alexandra wrote daily to her husband: 20 November 1914. "This morning we were present (I help as always giving the instruments and Olga threaded the needles) at our first big amputation. Whole leg was cut off. I washed and cleaned and bandaged all up." 25 November 1915. "During an operation a soldier died. Olga and Tatiana behaved well; none lost their heads and the girls were brave. They had never seen death. But he died in a minute. How near death always is." At that time, there was great hope that Russia would yet prevail in the war, and Fabergé was asked to continue the tradition of Imperial Easter Eggs. But to match the solemn mood of the nation and reflect the noble efforts of the family, Fabergé wisely altered the tone of the Easter gifts that year. In 1930 The Red Cross Portraits Egg was one of the ten Imperial Eggs sold by the Antikvariat to the Hammer Galleries in New York. 1933 (?) Purchased by Lillian Thomas Pratt. 1947 Collection of the late Lillian Thomas Pratt, willed to the Virginia Museum of fine Arts, Richmond, United States.